This year, we videotaped several of the breakout sessions at our Tribal Summit. These videos are now available on our YouTube channel, or can be viewed on the page below. Session 1, Ground-Surface Water, explores water allocation challenges among tribes that are located along state borders. Speakers included: Summer King (Environmental Specialist from the Quapaw Tribe of Oklahoma, Kansas, Missouri and Arkansas); Reggie Primo (Duck Valley Shoshone-Paiute Tribe of Idaho and Nevada); Norman Harry (Washoe Tribe of Nevada and California); Susan Jamerson (Washoe Tribe of Nevada and California). Session 2, Ground-Surface Water, explores ideas about how to build agricultural resilience through traditional values. Speakers included: George Toya (Pueblo of Nambe), Neil Mortimer (Washoe Tribe), Scott Goode and Anna Eichner (Nourishing Systems), Kapuna Kalani Souza (Native Hawaiian), Keir Johnson (Osage Tribe), and Laurel James (University of Washington). Session 3, Economics & Water, explores economic development strategies and livelihood development in agriculture. Speakers included: Jerimy Kidd and Latashia Redhouse (Ute Tribe), Buddy Rocha, Jr. (Yavapai-Apache Nation), Elise Teton (Shoshone-Bannock Tribe), and Kynda Curtis (Utah State University). 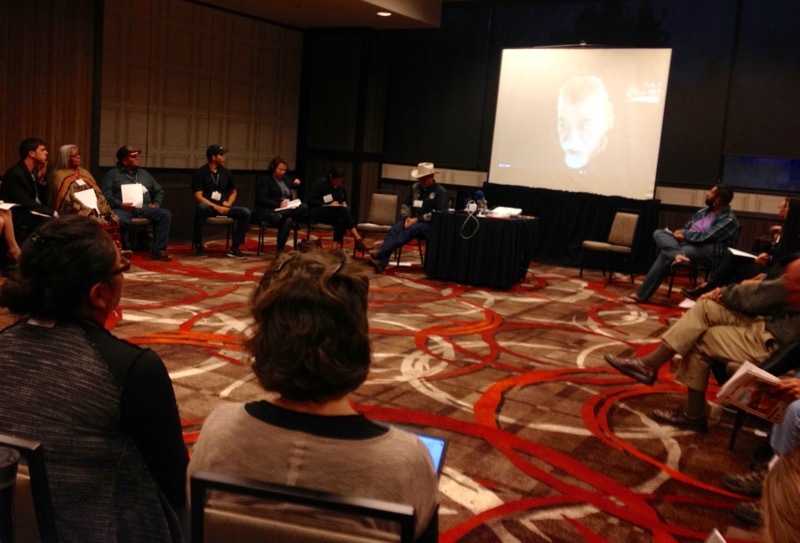 Session 4, Tribal Ranching and Conservation Practices, explores successes, challenges, barriers and solutions for sustaining and expanding economically viable ranching on Native Nations. Speakers included: Homer Marks, Sr. (Tohono O’odham Nation), Bill Inman (Navajo Nation), Randy Emm (Walker Paiute Tribe and University of Nevada, Reno), and Marquel Begay (University of Arizona, Dine College). Keynote speaker: Patricia Ferguson. Bayou Blues – The Struggle for Self-Determination on the Louisiana Gulf Coast.